27 March 2018 The British Tinnitus Association (BTA) will be visiting East Anglia for the first time, bringing the next in their series of FREE Tinnitus Information Days to Norwich. Already more than 50% booked, the event will be held at Norwich City Football Club on Saturday 21 April 2018. The day will feature presentations from renowned tinnitus experts including Colchester based ENT Consultant Don McFerran and Consultant Psychologist Laurence McKenna, as well as the opportunity to sample taster sessions including mindfulness, tai chi and relaxation which can help with managing tinnitus. 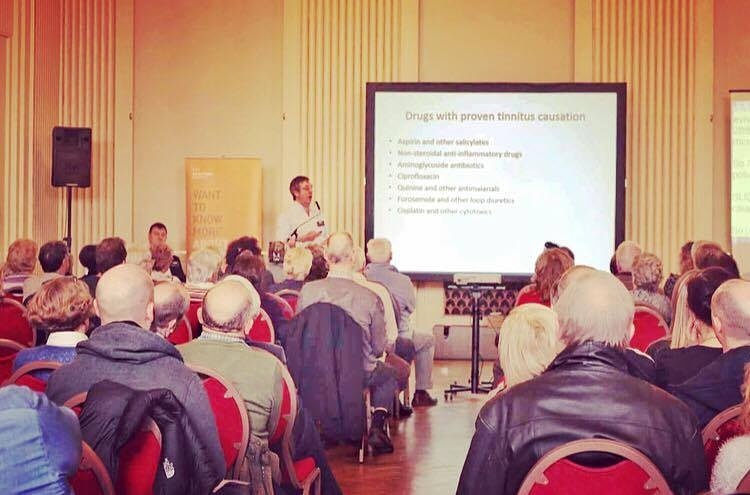 As the UK’s only charity solely dedicated to supporting people with tinnitus the programme aims to reduce stress, confusion, isolation, improve wellbeing and help people to cope with their condition. Alongside the BTA, there will also be an exhibition with stands from a range of organisations, all with ideas on how to support and manage individual’s tinnitus. Thanks to funding from the National Lottery through the Big Lottery Fund, this event is free of charge to attend. Light refreshments and lunch will be provided free of charge. The British Tinnitus Association (BTA) is an independent charity which supports thousands of people who experience tinnitus and advises medical professionals from across the world. The BTA is the primary source of support and information for people with tinnitus in the UK, facilitating an improved quality of life. They aim to encourage prevention through its educational programme and to seek effective treatment for tinnitus through a medical research programme. Not an illness or disease, tinnitus is a term that describes the sensation of hearing a noise in the absence of an external sound. The noise can have virtually any quality. Ringing, whistling, and buzzing are common, but more complex sounds may also be reported. Troublesome tinnitus can be very distressing for the affected individual, and issues may arise with sleep, concentration and mood. However, in many cases, subtle changes in people’s environment can address these issues, and improve quality of life. The experienced team at the BTA understands the impact that tinnitus can have on the lives of those who experience tinnitus and those who live with them, so seeks to provide the most appropriate and expert advice and information free of charge – via a confidential freephone helpline on 0800 018 0527 and online at www.tinnitus.org.uk. The BTA can also post printed and audio information and advice. * For more information regarding media usage, ownership and rights please contact British Tinnitus Association.